It is a criminal offence to drive, attempt to drive or be in charge of a motor vehicle on a road or other public place when a person has a specified controlled drug in their body and the proportion of that specified controlled drug exceeds the maximum legal limit for that particular drug. Drug driving is similar to drink driving; if a person drives, attempts to drive or is in charge of a vehicle while exceeding the legal limit of a specified controlled drug, they will be committing a criminal offence. The drug driving laws were introduced on March 2nd 2015 by section 56 of the Crime and Courts Act 2013  which inserted a new section into the Road Traffic Act 1988  (section 5A Drugs and Driving). The new drug driving offences came about in an effort to help reduce the amount of wasted time, effort and expense involved when prosecutions often failed under Section 4 of The Road Traffic Act 1988  (Driving or being in charge, when unfit through drink or drugs). In order to secure a conviction of driving while unfit through drugs under section 4 it has to be proven that a drivers ability was actually impaired by a drug. To secure a conviction of driving while exceeding the legal limit of a specified drug under section 5A no proof of impairment is necessary. Proof that the level of drug in a defendants body at the time of the offence exceeded the legal limit is sufficient. 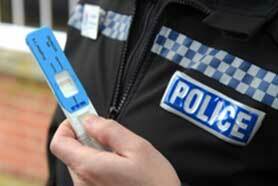 The police can test suspected drug drivers at the road side using a preliminary road side drug testing device. The securetec drugwipe 3S can detect traces of cannabis and cocaine at the road side in a matter of minutes. If a driver fails a road side drug test, a preliminary impairment test or refuses to co-operate with preliminary tests they will be arrested and required to provide a blood or urine sample for analysis. A driver can be arrested and required to provide a blood or urine sample for analysis if the police reasonably suspect they have been driving, attempting to drive or in charge of a vehicle and have alcohol or a drug in their system. Legislation has specified seventeen drugs alongside the maximum legal drug driving limit of each drug. The seventeen specified drugs include eight illegal drugs, eight medicinal drugs and amphetamine. There is a defence to the new drug driving laws under certain circumstances where a person is taking legal drugs for medical reasons. If you take prescription medication you must take your medication as instructed by your GP or relevant healthcare professional and/or in accordance with any instructions contained within the patient information leaflet (PIL) of the medication. Remember, if your ability to drive is impaired by drugs: DO NOT DRIVE! You can be prosecuted under section 4 of The Road Traffic Act 1988 if you do, even if you do not exceed the legal drug driving limits.